In our effort to understand the current state of web accessibility we have conducted several studies. This page provides a graphical overview of a selection of accessibility problems that we have explored. The first lesson that we learned is that all web pages are not created equally. In fact, in our studies, just a handful of sites (Google, Yahoo, MSN) accounted for about a third of all traffic. Therefore, it seems especially important that these pages are accessible. This is something that isn't immediately apparent when simply doing a web crawl. Not as much context is exposed to blind people when they browse and so browsing can often be more confusing. One way that we hypothesized that they overcome this confusion is to try things, see if they work and make decisions based on the result. We observed behavior consistent with this hypothesis in that blind users exhibit more of what we call "probing" while browsing the web. We define a "probe" as following a link, staying at the page that it points to for less than a minute and then returning. If the destination of a link is unclear, then we hypothesize that blind web users may follow the link simply to find out what's there. We observed that they do this significantly more than sighted people do. We looked at a number of different percentage-based comparisons of our groups. 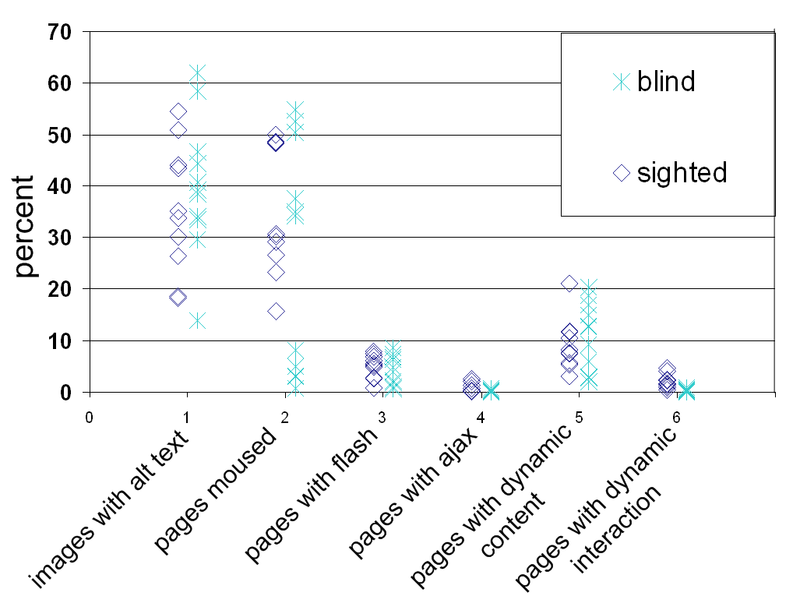 We found that on average the images contained on pages viewed by blind web users are more likely to be assigned correct alternative text. On average more images clicked on by blind web users have alternative text as compared to those images clicked on by sighted users. 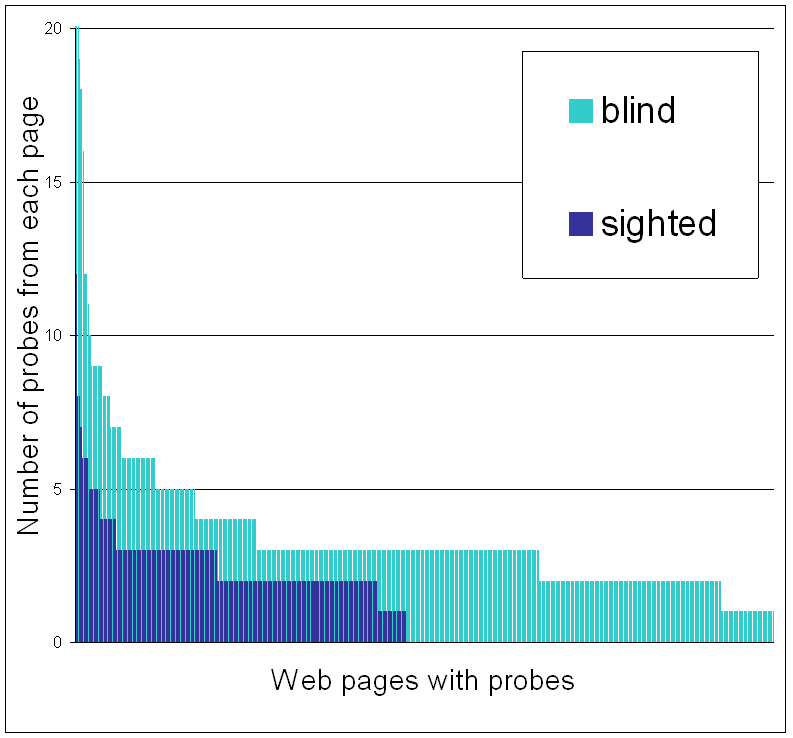 Unsurprisingly, blind web users use the mouse less often than sighted users, but they use the mouse on a surprisingly high percentage of the web pages that they view. 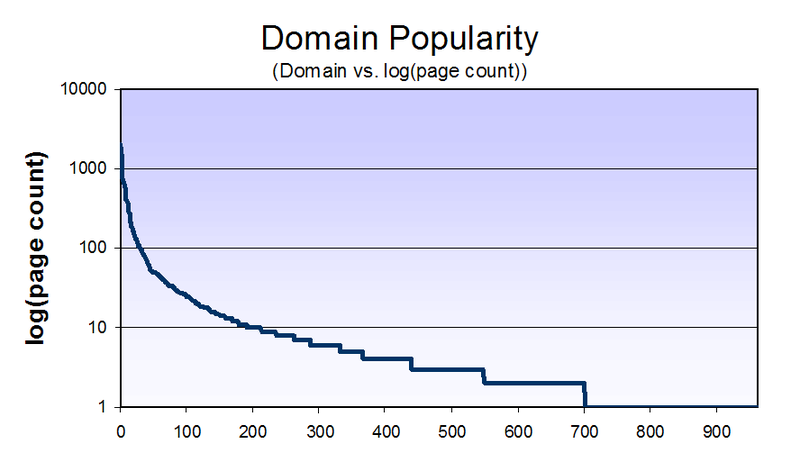 Blind web users view just as many pages containing Flash as sighted users do, but visit fewer pages that use AJAX and dynamic content.